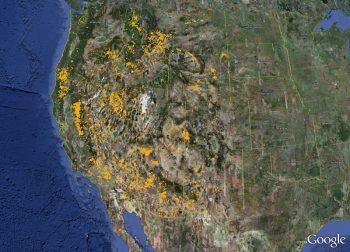 Gold Maps Online™ took a U.S. Bureau of Land Management (BLM) database of active and abandoned gold claims and converted the data so it could be seen as a gold map in Google Earth™. The result is an incredibly accurate near real-time view of America’s active gold deposits. And a must-have planning and exploration tool for any gold prospecting endeavor. The above image is a map of active gold mining claims (yellow clusters) rarely seen by anyone outside of a large gold mining company. This map can be viewed as a near real-time look at America's active gold deposits. It's near real-time because gold mining claim holders are required to pay annual fees to maintain ownership. They wouldn't do that if they were not finding gold on the property. Gold Maps Online™ and Google Earth™ lets you see where the active gold claims are located then explore the surrounding areas for promising non-claimed locations. You can generate latitude longitude coordinates for promising prospecting sites, record elevations, distances, grades, note roads and campsites, and get an excellent 3D satellite view of the terrain. All from the comfort of your home.